With the rising demand for off grid electricity, the global market for PV micro inverters is witnessing a tremendous rise. The increasing awareness regarding the efficiency of PV micro inverters and the benefits of MLPE technology is driving the growth of this market significantly. 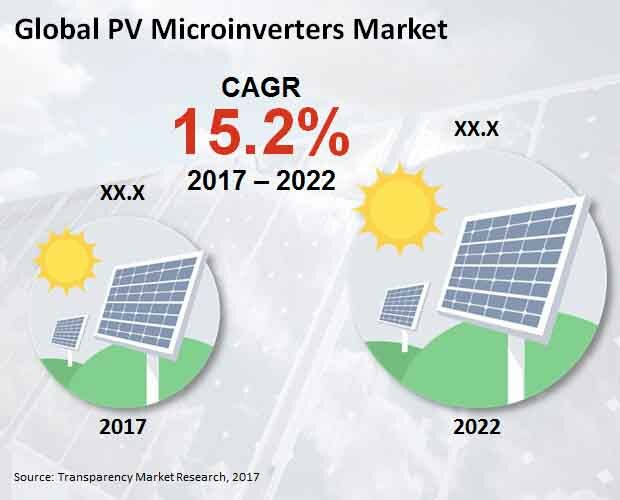 Over the coming years, the rising installations of PVs, growing preference for integrated products, and the escalating number of AC Modules are projected to fuel the demand for PV micro inverters across the world in the near future. By 2017 end, the worldwide market for PV micro inverters is expected to attain a value of US$489.1 mn. Further, the opportunity in this market is anticipated to rise at a healthy CAGR of 15.20% between 2017 and 2022 and reach US$990.3 mn by the end of 2022. PV micro inverters find a widespread application in the residential, commercial, and the utility sectors. The rising preference for highly efficient systems for constant power in residential setups has encouraged consumers to shift from conventional inverters to PV micro inverters, resulting in their high deployment in the residential sector. With increasing concerns of regulatory bodies over the safety of PV deployments, this trend is anticipated to remain so over the next few years. Standalone systems and integrated systems have surfaced as the key types of PV micro inverters available across the world. Holding more than 90% of the entire market, standalone systems are currently enjoying the lead. While, the segment’s hold on this market will loosen with time in the years to come, it will still stand on the top position throughout the forecast period. Primarily, PV micro inverters are available in single and three phase power class across the world. Europe, North America, Asia Pacific excluding Japan (APEJ), the Middle East and Africa (MEA), and Japan are the prime geographical segments of the worldwide PV micro inverters market. In terms of value, North America have been leading this market over the last few years and is predicted to continue it further at a CAGR of 15% between 2017 and 2022. The high rate of infrastructural advancements is the key factor behind the substantial rise of the North America market for PV micro inverters. Europe, which is at the second position in this market, is anticipated to remain here over the next few years, thanks to the increasing awareness regarding the benefits of PV micro inverters among consumers. However, Asia Pacific excluding Japan is projected to offer the most promising opportunities for growth in this market over the forthcoming years. With the increasing PV installation in China and the availability of micro inverters at low cost in this region are expected to propel the APEJ market for PV micro inverters, which is poised to expand at a 15.4% CAGR during the period from 2017 to 2022. The global market for PV micro inverters is highly competitive in nature. Sungrow Power Supply Co. Ltd., TMEIC, ABB Ltd., Schenzhen Kstar Science & Technology Co. Ltd., General Electric, TBEA SunOasis Co. Ltd., Enphase Energy Inc., SunPower Corp., SMA Solar Technology AG, and Darfon Electronics Corp. are some of the leading vendors of PV micro inverters across the world. The significant rise in the need for continuous supply of electricity has fueled the demand for PV micro inverters across the world. This research report presents a detailed analysis and forecast of the global PV micro inverters market, emphasizing especially on its regional performance. It provides the historical data of regarding this market while forecasting its status during the period of 2017 to 2022. The driving and restraining factors of this market, together with their impact on the demand for these inverters during the forecast period is discussed with high importance. A thorough study of the opportunities available in this market on the global as well as the regional level has also been included in the market report. In a bid to offer the readers of this research report with a comprehensive overview of this market, researchers have included an in-depth competitiveness analysis and information about the unique selling propositions of the leading players. Further, the report includes analyses of the market’s attractiveness and basis point share on the basis of the end-use, type, and power class of PV micro inverters. The market numbers have also been estimated in this study on the basis of the average usage of PV micro inverters in various application areas. The market size and predictions for each of the segment have been offered in the context of the global and domestic markets. The dynamics of PV micro inverters market Japan, Asia Pacific excluding japan, North America, Europe, and the Middle East and Africa have been taken into consideration for the estimation of the future growth of this market. The market has also been assessed on the basis of expected demand. The revenue generated from PV micro inverters across the world have been derived using the regional pricing trends. The market data for each segment is based on the demand and the corresponding revenue. Broadly, the global market for PV micro inverters is evaluated in the basis of the type of the system, end user, power class, and the regional spread of this market. Based on the type of the system, the market is classified into standalone PV micro inverters systems and integrated PV micro inverter systems. By end user, the market is categorized into the residential, commercial, and the utility sectors. Regionally, the market is divided into Europe, North America, Asia Pacific excluding Japan (APEJ), the Middle East and Africa (MEA), and Japan. The segmentation consist of the demand for PV micro inverters in all the regions as well as their significant economies. The patterns of the demand for these inverters in each of the regions have been determined while estimating the market for various application for PV micro inverters in them. Researchers have applied the top-down approach to evaluate the global PV micro inverters market, split by regions. While the segmentation of this market by the end user, system, and the power class has been derived through the bottom-up approach, which is accumulative of the demand from each of the regions. The regional demand for PV micro inverters is the summation of the prominent sub-regions and the economies within a region. Sungrow Power Supply Co. Ltd., TMEIC, ABB Ltd., Schenzhen Kstar Science & Technology Co. Ltd., General Electric, TBEA SunOasis Co. Ltd., Enphase Energy Inc., SunPower Corp., SMA Solar Technology AG, and Darfon Electronics Corp. are some of the key companies in the global PV micro inverters market. The market share of these companies has been derived by considering the revenues reported by the leading vendors.